We all know that the thigh bone’s connected to the shin bone and the shin bone is connected to the ankle bone…But, before we call the whole thing off, let’s discuss the lesser sung hero: the cartilage. Cartilage is our friend. We want it to hang around as long as possible, because it has the very important job of acting as a shock absorber and keeping our bones from grinding against each other. Sometimes our cartilage has a mind of its own. If you abuse it too much or if you have a family history of arthritis, you may lose cartilage sooner than you would like. The cartilage in our knees is particularly vulnerable because we use our knees so much. Once your knee cartilage begins to deteriorate, unfortunately, there is not much any of us can do to fight it. Each knee has two C-shaped tough and rubbery discs of cartilage between the shinbone(tibia) and the thighbone( femur). They act as shock absorbers to help cushion and keep the joint stable. 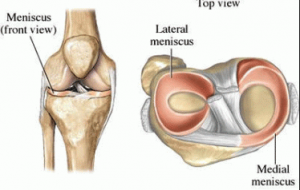 These are your menisci (plural of meniscus). A torn meniscus can cause pain, swelling, a wobbly feeling, and will prevent your knee from working correctly. A meniscal tear is a common sports injury, as it is usually caused by twisting or turning quickly, often with the knee bent while the foot is planted. These types of moves are frequently used in soccer, football, and basketball, so the injury is more common in those sports. The meniscus can also tear if you lift something heavy and turn just the wrong way. As we age, the meniscus slowly wears out and weakens, just like everything else! This can make it more susceptible to tear. Even an awkward movement when standing up from a seated position can be enough to cause a tear. A lot of times we don’t even know when we torn the meniscus. Minor – A minor tear will likely heal itself after 2 or 3 weeks. You may have swelling and slight discomfort and pain which will go away after a couple of weeks. Moderate – If a moderate tear goes untreated, your pain may come and go for years. You may feel pain if you twist or overuse your knee, and the pain is usually at the center or side of your knee. Swelling will get worse over a few days and might limit how you bend your knee. You will still be able to walk, but activity is limited. You might also feel a jarring pain when you squat, stand up, or go down stairs. Severe – If you have a severe tear, you will not be able to straighten your knee. It might give way without warning or feel very wobbly. After the injury, it might swell and become stiff right away, or it may take 2 or 3 days. A piece of meniscus may come loose and move into the joint space, which can cause your knee to lock or catch. We recommend seeing an orthopaedic physician if you suspect you have a meniscal tear. He or she will perform a physical exam, ask you questions about past injuries, activity level, and what you were doing when your knee started to hurt. The physician will check for range of motion and stability. He or she will also assess tenderness along the joint where the meniscus sits, which can signify a tear. Depending on what the exam shows, you may need to have a Magnetic Resonance Imaging (MRI) study to examine the knee and surrounding tissue. This will help confirm the diagnosis. Non-surgical – If the tear is not severe, it may not require surgery. Small tears typically heal with rest and physical therapy. If your knee is stable and your symptoms do not persist, you may see good results from non-surgical care. In this case, treatment will be the PRICE protocol, which is common for most sports-related injuries. PRICE means Protection, Rest, Ice, Compression, and Elevation. You may also need to do physical therapy. Rest – Enjoy some time off from the activity that caused the injury, and try to avoid any new activity that would aggravate the injury. Ice – Do not apply ice directly to skin. Use cold packs several times per day for about 30 minutes at a time. This will help with inflammation. Compression– Wear an elastic compression bandage around your knee. This will help prevent additional swelling. Elevation – This is also to reduce swelling. Recline when you rest, and make sure your leg is elevated higher than your heart. In addition to PRICE, we will recommend that you take non-steroidal anti-inflammatory medications such as aspirin, Naprosyn, or Ibuprofen. These medications help reduce pain and swelling. Surgical – If your symptoms persist after trying non-surgical treatment, your doctor may suggest surgery. We often recommend surgery for larger tears at the outer edge of the meniscus because they may not respond as well to PRICE and therapy. The outer edge of the meniscus is further from its blood supply and nutrients, so it may not be able to heal as well. Meniscal tears are repaired using knee arthroscopy, which is a very common surgical procedure. A miniature camera is inserted into the knee through a small incision. The camera allows a very clear view of the inside of the knee. The surgeon then makes additional small incisions and inserts miniature surgical instruments to repair or remove the tear. You will begin rehabilitation exercises shortly after surgery. We cannot emphasize the importance of these exercises! They will help restore your knee strength, mobility, and range of motion. Rehab is crucial to your recovery. Meniscal tears are common injuries. With proper diagnosis, treatment and rehabilitation, patients often return to their previous level of activity. Boyd W. Haynes III, MD is a fellowship-trained, board certified Orthopaedic Specialist with Orthopaedic and Spine Center in Newport News, Virginia. Dr. Haynes’ practice is focused primarily on sports-related injuries and disorders. Call 757-596-1900 to make an appointment. Visit www.osc-ortho.com to learn more about OSC and Dr. Haynes. Dr. Boyd Haynes reviewing knee x-ray with patient.